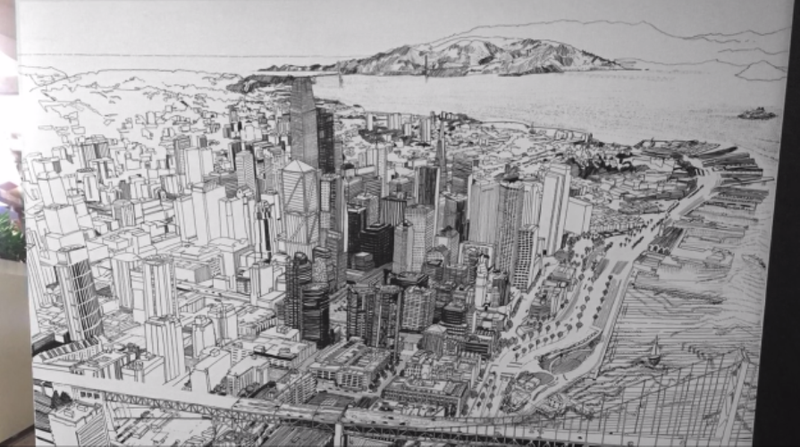 Patrick Vale is a London-based artist, illustrator, and animator, who has gained recognition for his impressive panoramic drawings of cities all over the globe. Patrick Vale mural for IDEO from patrick vale on Vimeo. Most recently he has completed a detailed mural for design company IDEO’s studio located in San Francisco, California. Vale has released a time lapse video of the drawing process which took him 13 days to complete. The video shows vale creating the mural, depicting the city to include a painstaking amount of detail. The mural includes the famous Golden Gate Bridge and is a bird’s eye view over the north of the city, with the Bay Bridge occupying the foreground of the picture. Iconic San Francisco architecture also makes an appearance, with the Transamerica Pyramid Building sitting in the centre of the mural. To see more of Vale’s work, visit his Instagram, Facebook or website.